Philotrypesini Wiebes 1966. Type gernus: Philotrypesis Wiebes 1966. Old World: Afrotropical, Oriental and Australsian regions. 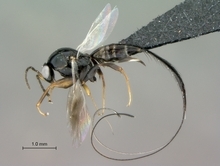 Parasitoids/inquilines of other fig wasps associated with sections: Conosycea, Galoglychia, Sycocarpus, Urostigma, Ficus and Sycidium. Wiebes, J.T. 1966. The structure of the ovipositing organs as a tribal characters in the Indo-Australian Sycophaginae Torymidae (Hymenoptera, Chalcidoidea). Zoologische Mededeelingen, Leiden. 41:151-159.